Libya rebels: NATO not doing "anything"
BENGHAZI, Libya - A rebel military leader lashed out at NATO, saying it was falling short in its mission to protect Libyan civilians, and that it was too slow to launch airstrikes against government troops on the eastern front lines -- allowing the opposition to be routed from the oil port of Brega. "NATO is not doing their job, the aistrikes are late and never on time. NATO is not helping us. Qaddafi still gets ammunition and supplies to his forces, that's why he is pushing us back," said Pvt. Mohammed Abdullah, a 30-year-old former member of Qaddafi's army who has joined the rebel side. "We don't know what he would be able to do if there are no airstrikes." But NATO rejected that criticism, saying Wednesday that its airstrikes against Muammar Qaddafi's forces are increasing every day. "The ambition and precision of our strikes has not changed. The facts speak for themselves," Carmen Romero, NATO's deputy spokesman, told The Associated Press. She said the situation in the besieged rebel-held town of Misrata remains a priority for NATO's military operation. NATO assumed command of the aerial onslaught on Libya a week ago, conducting 851 sorties in the first six days. Although the alliance does not normally release information on the number of airstrikes on Qaddafi's forces, it said warplanes had bombed 14 targets on Monday. Canadian Lt. Gen. Charles Bouchard  who commands the Libyan operation from his headquarters in Naples, Italy  estimated that 30 percent of Qaddafi's military capacity has been destroyed since the airstrikes began March 19. 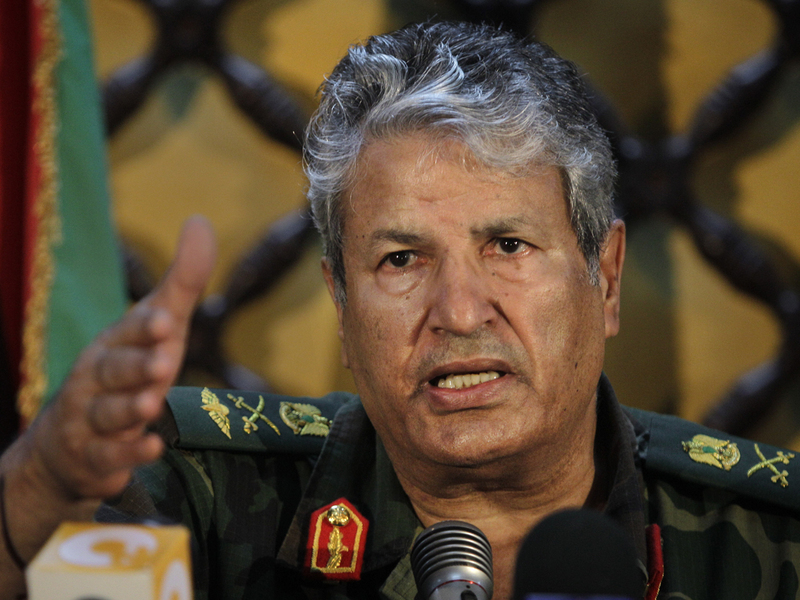 Romero said that, contrary to claims by the Libyan rebels, "the tempo of operations is even increasing." She said the alliance flew 137 missions on Monday, 186 on Tuesday, and 198 were planned for Wednesday. But Romero also said NATO's priority is to avoid harming civilians and therefore "all operations are carried out in a very vigilant way." In Naples, Rear Admiral Russ Harding, the deputy commander of NATO's Libya operation, reminded the rebels that the U.N. mandate under which NATO is operating is to protect civilians. "Let me be clear, it did not say to gain the trust of either side in doing that." He said, when "there is a tank with dozens of people around ... the best thing at that stage is probably not to drop a bomb on the tank." Still, NATO jets destroyed a substantial number of heavy vehicles and tanks in Misrata on Tuesday because they were directly threatening the population, Harding said. Britain, which is increasing its number of fast jets in Libya from 16 to 20, declined to comment Wednesday on the rebels' criticism. The defense ministry confirmed that U.K. fighter planes had fired on targets in Misrata and Sirte on Tuesday. "A total of 12 targets were hit  six armored fighting vehicles and six battle tanks," a ministry spokesman said on condition of anonymity in keeping with government policy. On Tuesday, Dutch Brig. Gen. Mark Van Uhm said pro-Qaddafi forces had changed their tactics in the past week, keeping heavy equipment such as tanks and armored vehicles in the rear while deploying only light forces mounted on trucks to confront the rebels. He said that meant that NATO airstrikes were having a deterrent effect as well. "We are also preventing him from using those assets ... so that without even targeting them we already have an effect that he can't use them," Van Uhm said. He also said Qaddafi's tanks in Misrata had been dispersed among civilian buildings, and that Qaddafi's forces were using civilians as human shields to prevent NATO airstrikes on them. Seventy-five percent of the airstrike missions Monday had to return without dropping their bombs or launching their missiles because of this and other factors that made it difficult for pilots to distinguish between civilians and regime troops, said Van Uhm. "If they see the target but see humans being used as human shields, they come back," he said. Rebels, meanwhile, were trying to sharpen their frontline forces. Former Libyan military officers who have joined the opposition were trying to keep untrained fighters from advancing from the eastern gateway city of Ajdabiya toward Brega. But that was causing tensions within the rebel ranks. "We only allow the people to have training to pass," said Walid al-Obeidi, a 25-year-old from nearby Benghazi who was a private in the Libyan army before defecting and was manning a checkpoint on the western outskirts of Ajdabiya. Trained rebels flew through the checkpoints in pickups mounted with anti-aircraft weapons. One rebel in uniform got out with a grenade hanging from his vest and a Kalashnikov rifle flung across his shoulder. Others gathered around him, chanting: "God, Libya and freedom!" But a scuffle broke out at the when one of the untrained fighters tried to go through toward the front line. "Kill me here if you don't want to let me in! Let me in, I am trained to use weapons and mortars. My friends are there, let me in," he said, refusing to give his name to reporters as some guards in camouflage uniforms prevented him from passing while others tried to calm things down. In another incident, a pickup truck carrying a group of ragtag rebels tried to go around the gate, but a rebel army officer fired warning shots in the air, then into the truck's tires to stop it. Those rebels who were not allowed to advance sat around, chanting anti-Qaddafi songs and clapping. Raib bin Aruz, a 23-year-old student from the coastal town of Darna, said he hoped they be allowed to go to the front in the afternoon, after an expected airstrike. Saeed Imbarak, 43, a businessman, said he wanted to fight but didn't have a weapon. "Qaddafi has weapons but we don't have enough. The Libyan people need more support from NATO. If we don't get it we expect a lot of massacres from Qaddafi. We expect him to take over all of Libya and to massacre all of us," he said. Although NATO does not normally release information on the number of airstrikes on Qaddafi's forces, it said warplanes had bombed 14 targets on Monday. Canadian Lt. Gen. Charles Bouchard  who commands the Libyan operation from his headquarters in Naples, Italy,  estimated that 30 percent of Qaddafi's military capacity has been destroyed. In a step toward getting more money for weapons and other needs, a Liberian-flagged oil tanker arrived Tuesday in the eastern city of Tobruk to load up the rebels' first shipment of oil for export in nearly three weeks as part of a deal with Qatar. The tanker can carry 1 million barrels of oil, less than the 1.6 million barrels Libya produced every day on average before the crisis.